Salmon is great on the grill and it’s good for you! Whether you have a charcoal or gas grill, it's easy to cook perfect salmon every time. The key is to not overcook it. Grilled salmon is simple and delicious. You'll only need a few minutes of actual grilling time, and there are so many ways to prepare your salmon, from simply brushing on some olive oil to concocting a masterful marinade or rub to enhance its flavor. If you choose to marinade your salmon, be sure not to leave it in the marinade for more than 15 minutes; the acidic ingredients in the marinade will begin to break down the flesh and make it mushy. I find that a light brushing of olive oil and a sprinkle of salt and pepper are all that are needed to produce a delicious grilled salmon. You can try more elaborate rubs, or even coating the salmon with mayonnaise prior to grilling. The important thing to remember when learning how to cook salmon is to keep it simple. Salmon doesn't require a lot of additional seasoning or fuss. Choose salmon fillets or steak that are about one inch thick and preferably with the skin on. Follow one of the methods below and your salmon will be grilled to perfection! 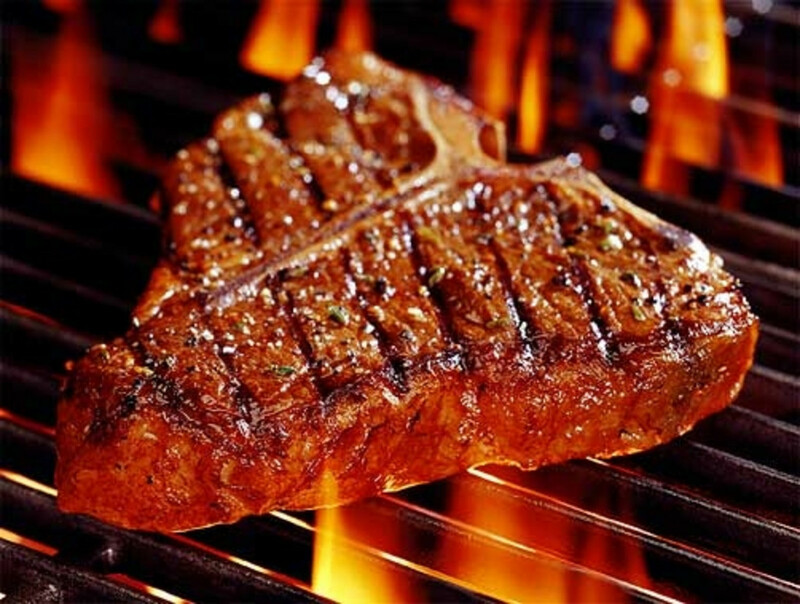 Grilling Tips - Preheat the grill to medium-high. If you have a charcoal grill, the coals should be bright red and any flames should have subsided before you place your fish on the grill. If you have a gas grill, set the temperature between 300 and 325 degrees F. The best way to tell if your grill is the right temperature is to hold your hand about 4” above the grill rack, if you can hold you hand in this position for 4 to 5 seconds, the grill is medium hot. 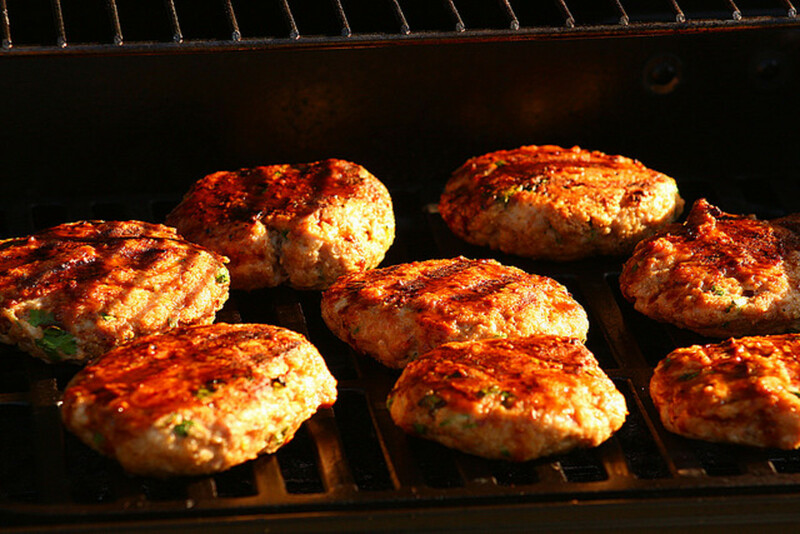 If you need to move it away sooner, the temperature is too high and you’ll need to turn your grill down. Lightly oil the grill before placing your salmon on it. The easiest way to do this is to dip a paper towel in vegetable oil and using tongs, rub the towel on the grill to lightly coat it. Salmon is meaty enough to not fall through the grill rack, but if you prefer, you can wrap the rack in heavy-duty aluminum foil for extra protection. If you use foil, be sure to oil the foil before putting your fish on it. 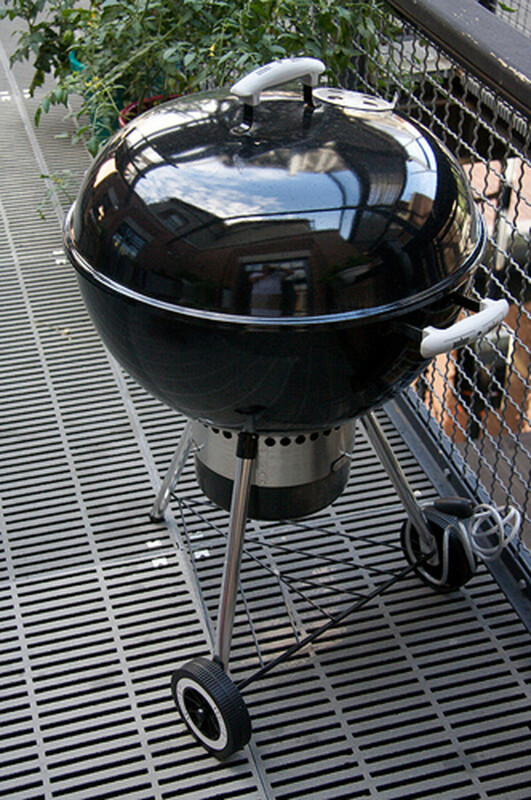 You can also use a special two-sided grilling basket which is extremely handy for this type of grilling, but once again be sure to oil it before use. Cook the fish until it’s opaque, turning it only once during cooking. This will only take about 4 minutes per side, so be sure to watch it carefully. You’ll also want to be sure that no flame directly touches the salmon. There’s no need to close the grill. Set a timer; don’t mess with the salmon until the timer goes off. Be close by so you can remove it promptly and be sure that you DO NOT OVERCOOK it. When you remove the salmon from the grill, it should be slightly undercooked because it will continue cooking for a few minutes from the residual heat. Gently press on the fillet, if it’s squishy, it’s not done. Put it back on the grill for a minute or so. If the fillet is firm with a little give, it’s medium rare, which is the recommended doneness for salmon. That’s really all there is to it. Grilled or baked salmon is an excellent addition to your weight loss program. 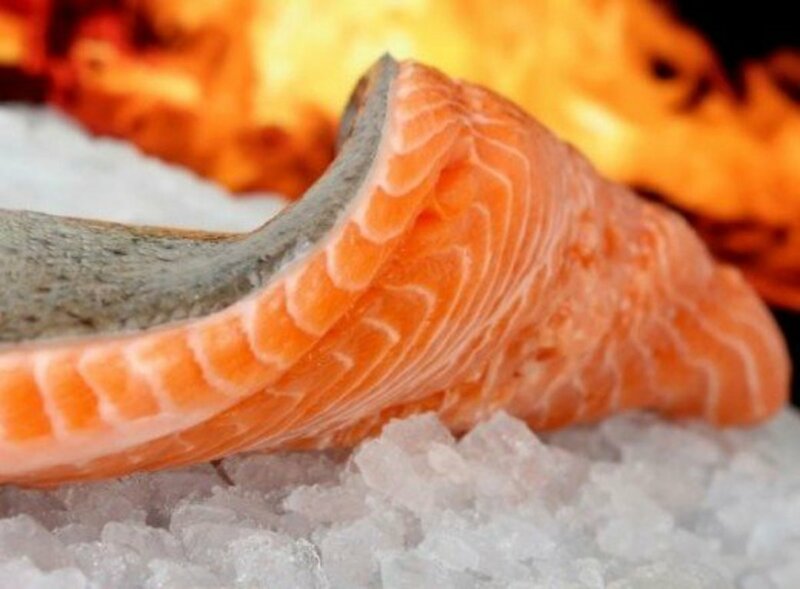 A 5 oz fillet of Atlantic Grilled Salmon contains only 250 calories, 13.8g Fat, 0g Carbs and 43.2g Protein. 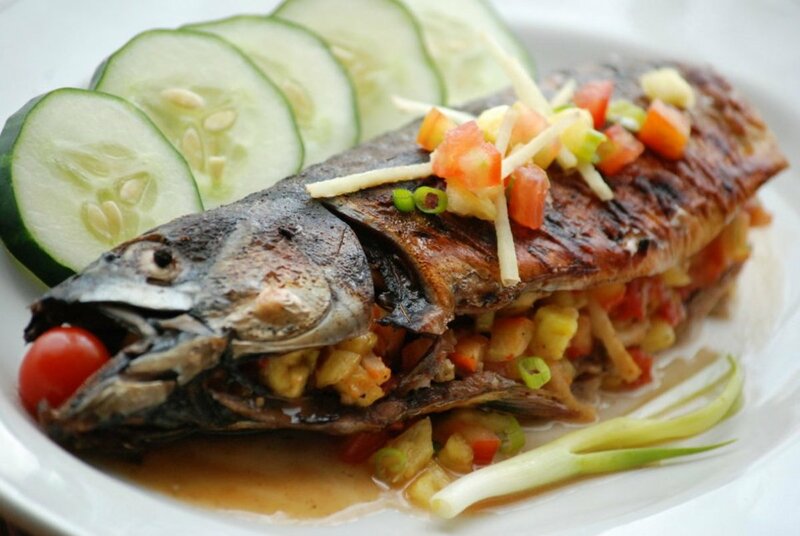 It is also an excellent source of Omega-3 Fatty Acids. A quick alternative to grilled salmon is to bake it. With some easy baked salmon recipes, you can prepare the dish in the morning and it will be ready to go in the oven as soon as you come in the door from work. Nothing could be tastier or simpler! 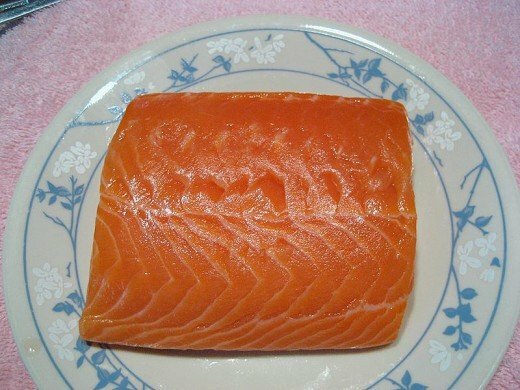 Lay a salmon fillet or steak on a large rectangle of heavy-duty aluminum foil. Season the salmon to taste with a little lemon juice, garlic, salt, pepper and dill. Securely wrap the fillet in the foil, folding tightly to seal the packet. 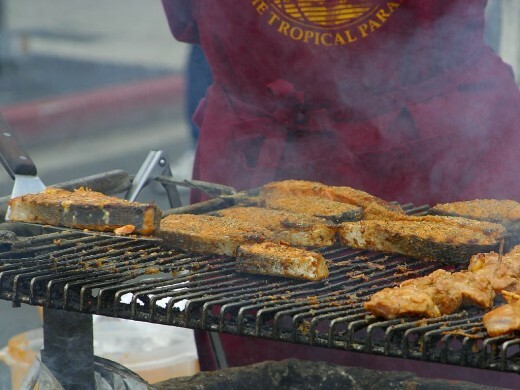 Here’s different approach to grilling your fish. Place seasoned salmon fillets in a brown paper bag and tie it up with a string. Dip the tied fish in cold water and promptly transfer to the hot grill. The paper will blacken but the fish will remain intact and cook to your taste. Turn the bag over after 3 to 5 minutes. Place the bag on a plate and carefully cut the string and tear off the paper. If you don’t have a grill, all is not lost. You can use a grill pan indoors. Preheat your grill pan over medium high heat until it’s hot but not smoking. Be sure to lightly oil the pan to prevent the salmon from sticking. Place salmon directly on the grill pan and adjust cooking times until desired doneness is reached. Another great method of preparation is baked salmon, which always comes out delicious and moist for a perfect presentation. Remove salmon from the refrigerator and allow it to come to room temperature before grilling. Some people think that adding salt prior to grilling draws moisture from the fish, the very thing you’re trying to avoid. You might want to hold off on the salt until the salmon is removed from the grill. To add a light smoke flavor to your salmon, try tossing a handful of cedar chips directly on the coals just before adding the salmon. For gas grills, you can place cedar chunks directly on the grilling surface. When they start to smoke, it’s time to add the salmon. For an extra special dish, consider serving grilled salmon with a sauce made from one of the 5 classic mother sauces. Absolutely Delicious! An excellent desert idea would be a fast and easy Fruit Crunch Cake. Grilled salmon goes very well with a simple green salad and rice pilaf or boiled red potatoes. Hi texasgirlfw, I'm glad you stopped in to read our article. I hope you give it a try to find the tips useful. A lot of people have trouble telling if fish is done, but these tips should help. Thanks for commenting. Thanks for this good recipe. I always have trouble grilling fish. Salmon cooked on a cedar plank is delicious! I love it! Thanks for reading and commenting! There's nothing like grilled salmon. Just love it. I usually go with a marinade -- gonna try to strip it down a bit and just do the Olive Oil, salt and pepper touch. Sounds great. Have you ever tried grilling salmon on Cedar Wood Planks? Also an excellent method, giving it some extra flavor, and a very nice presentation when you remove the planks from the grill. Thanks charis007, hope you try some of these recipes and let us know what you think! Pretty interesting stuff, i will have to give it a shot. Thanks Chef Basket! I'm glad you liked it. Good tips for checking to see if its done. Thanks for sharing. gerry69plus, you have a lot of will power to read food hubs while fasting! I'm glad you liked it, give it a try on another day...I think you'll find it's delicious. Thanks for reading and commenting. saddlerider1, that sounds absolutely delicious! I am definitely going to try your recipe ... I can't wait! Thanks for the comments and the vote vocalcoach! Always glad to see you stop in. I love salmon and your suggestions for grilling are so good. Thank you - rated up. RTalloni, that's an interesting comment about the eczema ... I'm going to check in to that. One of my boys suffers horribly with eczema. I just might need to be grilling salmon a little more often! Yum stuff. Thanks for sharing... :) Love it off the grill but don't always get around to it. I can smell it now, though! Recently I was reading up on salmon and learned that it can help problems with eczema, of all things! Great hub! I eat salmon quite a bit, so thanks for the tips! Hi happynmomof3, grilled salmon is delicious. Give it a try! :) Thanks for reading and commenting. Thanks for the info - I need to perfect my grilled salmon! Thanks dawnM, I hope you give this a try! Thanks Lamme...my employer just love Salmon and your article is so helpful to me. Im new here and i know, i would be one of your avid follower....please ....more recipes on fish?...do you have any recipe for "Catfish"..? Thanks and regards. Hi jonathan, I think you'll find it delicious on the grill. I hope you enjoy it! Thanks for stopping in. Salmon is one of my favorite foods, but I hardly ever think to grill it on my outdoor kitchen. I think I'll make some tonight!! Thanks HealthFreak, I appreciate your reading and commenting. Hi stephhicks68, I love salmon too. Thanks for reading! Grilled salmon is so perfect - great tips not to overdo it! ooh, plank salmon is also excellent! You're so right akirchner, salmon in everything! LOL Love it. Thanks for stopping by. One of my favorite foods - salmon - and grilled is to die for! It flakes so nicely if done to perfection and then you can have leftovers for making salmon patties or salmon spread or putting on salads or adding to eggs or quiches....anything salmon will do and it's SO good for you. Plank salmon is also an awesome way to grill it! Super info. Hi twogroce, I think lemon pepper salmon on the grill would be delicious! Yumm! That salmon looks divine.. and your directions seem so easy to follow. I must try to grill this for my fiancé. I love lemon pepper salmon but I do not think I have ever had it grilled. Thanks for the hub...is sounds very yummy!!! bgamall, that is so true! Having a source of VERY fresh fish is always important. Thanks for stopping by and commenting. I love Salmon grilled. The secret is fresh Salmon. Certainly if you live close to the coast, or if you are able to have a source of Salmon flown in fresh, that is the way to go. Thanks Splitty Booms, I hope it turns out perfect for you! You do have to be careful to not overcook fish, it's easy to do. I do it this way...but wasn't quite sure it was the correct way. But after reading your hub, I see my mistake is that I overcook the salmon. I'm a scaredy-cat when it comes to undercooking meats, so I tend to overcook instead. I'll follow these instructions of yours this holiday! Thanks for an easy to read and follow hub! Thanks SpiritLeo, I agree ... I love fish! Thanks for stopping by and commenting. Love fish in any forms! Great hub! Thanks lizmoss71! Your suggestion sounds delicious, I'm going to try it next time I grill salmon. Nice hub! I love grilled salmon - try brushing it with a mixture of honey and soy sauce for a simple and tasty marinade. Thanks pcunix, I think it's great either way! celinewayne, not only is it delicious, it's very healthy! Not often we get both of those in the same dish ;) Thanks for commenting. Hi Polly, thanks for stopping by. Salmon is an excellent addition to a healthy diet. I think you'll find it's very easy to prepare and delicious. I'll be back to read more of your hubs! Thanks Kosmo! Smoked salmon is delicious, and so easy. Thanks for stopping by and commenting. I can taste that grilled salmon right now! You sure make it sound appetizing. We smoked some salmon on a grill one time many years ago, and I still remember how good it tasted. Later! Cool, thanks. I just don't want to poison my family. LOL. Hi Shadesbreath. You asked a couple of very good questions. The reason I emphasized to not overcook the salmon is because it's something that most people do. You need to be watchful because it will go from done to overdone very quickly. If you overcook it, it will have a tougher texture. It also loses many nutrients. You'll also want to be sure that you buy your fish from a reputable fishmonger, you want to be sure that it's fresh. Salmon doesn't take much time to cook, so if you watch it and check for proper doneness, you won't need to worry about it being raw. If in doubt, use an instant read thermometer. 1) Why do you put "do not overcook it" in all caps... what happens? 2) What happens if it's under-done, does it make u sick or something, or is it like sushi, and ok raw anyway? Thanks abonded4life. I'm glad you like this, I hope you give it a try. Thanks for reading and commenting. Oh ethel, I'm sorry to hear about your husbands allergy. Treat yourself once in a while, you'll need to make something different for your husband, but sometimes it's worth it. Thanks for stopping by and reading. Hi tim-tim, I love salmon too. It's very good for you, especially if you cook it right. Thanks for stopping by and commenting. I love Salmon. Thanks for the hub! I never heard of one for making grilled cheese! I know they make a special basket just for fish. Another thought about that grill basket. It was very popular many, many years ago as a way of making a grilled cheese sandwich over the flame of a gas stove. Trish1048 left a reference to that grilled cheese cooking technique on my hub about molecular gastronomy, which is how I know about it. What I'm thinking is that there may be a market in those vintage grill baskets. What a hoot! Re-visit, re-purpose! Hi Sally, I'm thinking of getting me one of those grill baskets. I bet it would make grilling any kind of fish much simpler. Not only that, there would be no risk of it breaking! Thanks for stopping by and commenting. Thank you for these great simple recipes and very useful tips. Love the idea of using the grill basket. Now I'm hungry too! Wow...just reading this made me hungry for grilled salmon. Excellent article, very informative. Keep up the good work.